Like a lot of us, Emily Margolis started running because she was watched someone she admired go running. In Margolis’ case, her aunt Linda Epstein ran A LOT. “From the time I was born – she was just always running,” Margolis says of her aunt. 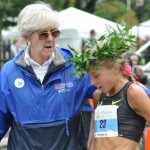 “She got into the wave of women’s running – [and would run] a lot of 10Ks, community races here and there, and then she ran the Boston Marathon in 1986. 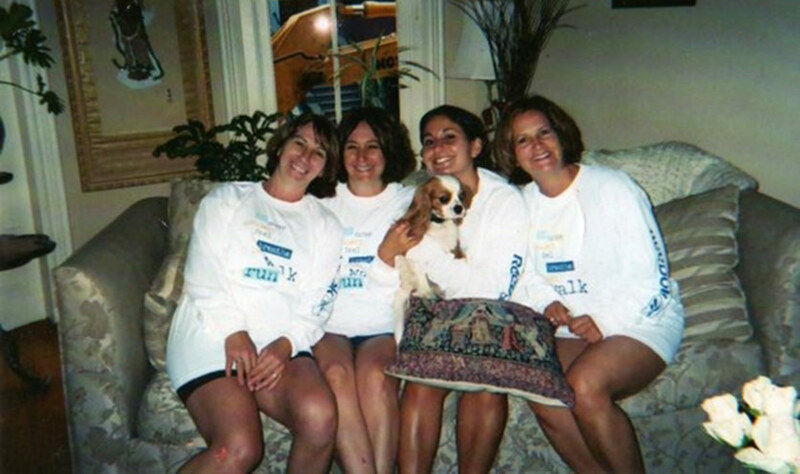 After the 2003 race, Linda Epstein, Epstein’s sister Caron Stringi, Emily Margolis (with dog Reggie) and Emily’s mother Arleen Schwartz (L to R) gathered for some post-race love. 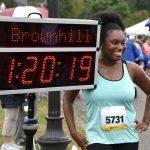 In 1982, she fell in love with the Bonne Bell Mini Marathon, now the Reebok Boston 10K for Women. 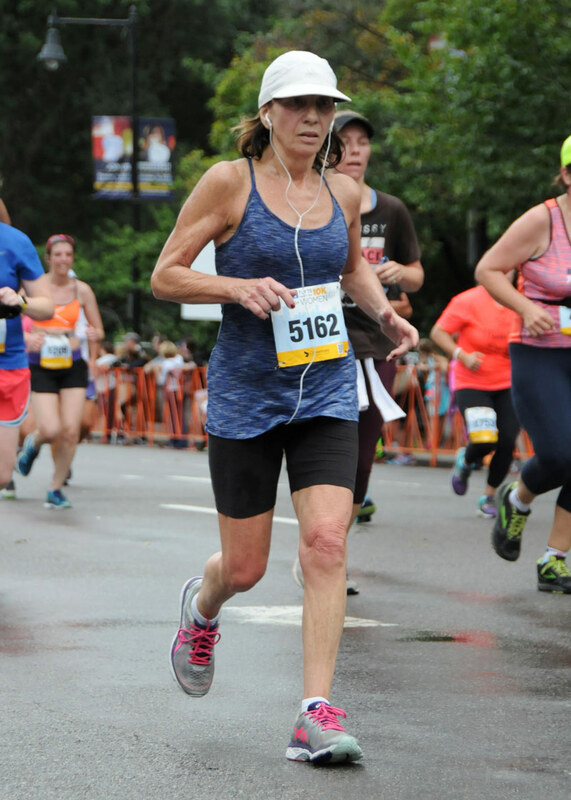 “The feel, the date, and 9 times out of 10 it was great weather, and all the excitement here – she just loved it.” Epstein raced every Columbus Day except for 1990, when she was in labor with her son, Jared. “She was a creature of habit. She ran six miles a day, six days a week, for almost 40 years,” says Margolis. Her dedication was legendary—when a storm brought down a tree at her office park in Peabody, it blocked her daily route. She called to have it removed. When the help never came, she proceeded with her run, climbing over and through the tree, sticking to her routine. 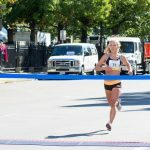 A force of nature in her own right, Epstein won her age group regularly in races around Massachusetts and became a familiar face with track clubs and running groups around town. Epstein and her family were stunned. “It was quick moving, and hers was particularly bad,” says Margolis. “She thought she could beat it. Nothing seemed to work. It was just really, really, really fast.” On April 20, 2018, Epstein died at just 65 years old. As another Columbus Day nears, Margolis knows where Linda would have wanted to be. She can envision her aunt running her daily miles and gearing up for another finish on Charles Street. That’s why she, her mother Arleen, and Epstein’s sister Caron will pin on their bib numbers and take to the starting line as part of “Linda’s Team” on October 8. Epstein’s husband Rick, her son Jared, and her daughter-in-law Erica Epstein will be cheering on from the sideline, and the family will gather to celebrate Linda Epstein’s favorite race. We can’t wait to cheer them on. Do you or someone you know have an inspiring or powerful story tied to this race? 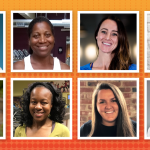 Send us the details at stories@boston10kforwomen.com.